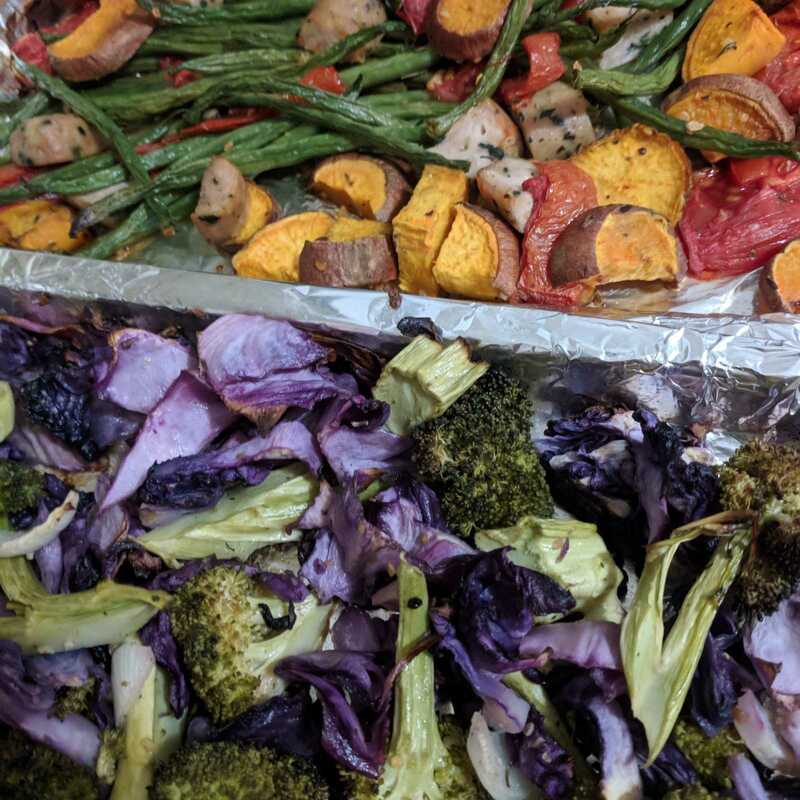 Lots of vegetables such as broccoli, cauliflower, cabbage, tomatoes, onions, bell peppers, mushrooms, romaine, kale, arugula, cucumbers, garlic, asparagus, carrots, zucchini, celery, green beans, sweet and red potatoes, squash of sorts, and of course avocados, etc. A variety of fruits like clementines, apples, berries, mangoes, banana, kiwi, figs & dates, etc. As well as rolled oats, quinoa, rice, rice cakes, beans, corn tortillas, nut butter, nuts, seeds, coconut oil, hemp oil, cashew milk unsweetened, hemp hearts, flax seed meal, pb2 Fit, spices, dark chocolate, shredded coconut, flax seed meal, almond/ coconut flour, diced tomatoes, etc. *Notice there are no chips, cereal, tv dinners, pastries, etc because when I buy those they are eaten too fast. So these should be eaten in moderation. I love making big stir-fries or roasting lots of veggies and potatoes and sometimes a healthy batch of quinoa or rice. You could also do some pasta or spiralized veggies. 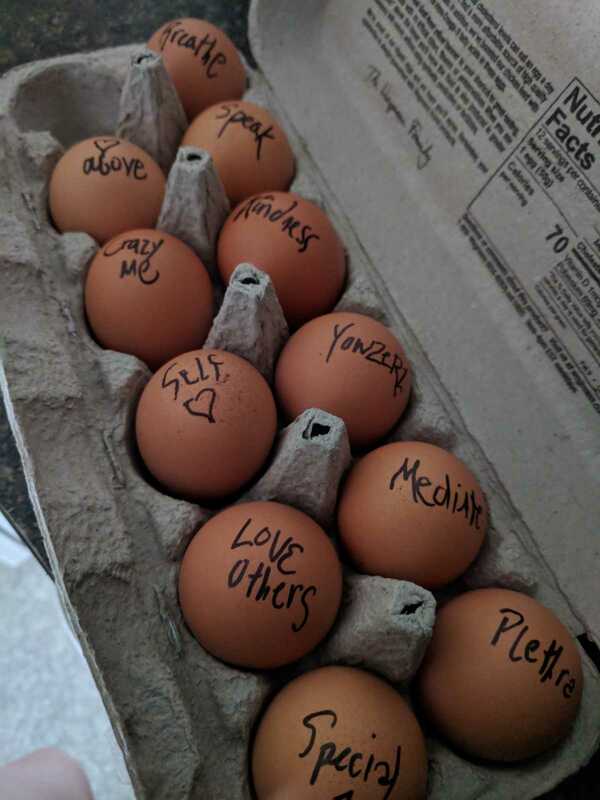 Hard-boiled eggs for early morning grab and go breakfasts. I usually make some kind of no-bake bites, protein bars, or muffins for breakfast or snacks. Sometimes I make overnight oats for extra early mornings. A whole chicken in a crockpot is a great way to cook protein for the week. Cutting up your celery, carrots, peppers, any other veggies you use often to make things easier in a hurry. Veggies of sorts to snack on with hummus or throw a simple salad together make life better when you're hungry. You can even throw the cut up veggies in a pot of boiling water to make life easier at dinner time. Sometimes I make a batch of homemade hummus or pesto for those cut veggies or even guacamole. Salad in jars is such a great idea, or healthy "mug cake" breakfasts are pretty quick and versatile. I always have a variety of fruit to grab on the go or make a fruit salad to have for a few days. As it gets cooler here I will utilize my crockpot at least once a week and make a big batch of soup or chili or some other variety. For me, taking the time to at least think ahead makes a world of difference. I love when I have leftovers, it saves time and that's the best, especially when the day gets away from you and the "hangry" feelings set in. These things have helped me each week, to be more conscious of my eating habits. Everyone has to do what works for them. Some people don't care for leftovers so every day could be a new food adventure. Just give yourself time to prep each night or get up earlier to make your food for the day. Being prepared is a sure way of eating healthier than if you had nothing planned. If you are planning for a whole family these ideas would still work, but do what works for you. Get creative. Some people portion out individual meals or freeze meals to take out each day. Being prepared for whatever it is the day has in store, is key.